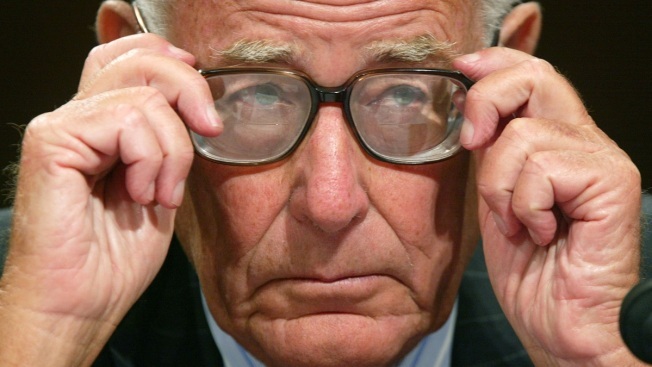 Former Defense Secretary Harold Brown listens to opening statements during a hearing before the Senate Armed Services Committee September 9, 2004 on Capitol Hill in Washington, DC. The hearing focused on the findings by an independent panel to review Department of Defense detention operations. Harold Brown, who as defense secretary in the Carter administration championed cutting-edge fighting technology during a tenure that included the failed rescue of hostages in Iran, has died at age 91. That turbulent period included the Soviet Union's invasion of Afghanistan and the Iranian hostage crisis. An effort in April 1980 to rescue the hostages failed when one of the helicopters on the mission struck a tanker aircraft in eastern Iran and crashed, killing eight U.S. servicemen. "I considered the failed rescue attempt my greatest regret and most painful lesson learned," Brown wrote in his book "Star Spangled Security." "When I became secretary of defense in 1977, the military services, most of all the army, were disrupted badly by the Vietnam War. There was general agreement that the Soviet Union outclassed the West in conventional military capability, especially in ground forces in Europe," he wrote later. "The constant Cold War competition raged hot during the Carter administration and preoccupied me throughout the four years," Brown wrote. He noted later that "the Defense Department budget in real terms was 10 to 12 percent more when we left than when we came in," which he said was not an easy accomplishment. "Some of these came to visible fruition 10 years later during Desert Storm, which reversed Saddam Hussein's occupation of Kuwait," he wrote. "The Carter administration initiated and developed these programs, the Reagan administration paid for their acquisition in many cases, and the George H.W. Bush administration employed them." "We also reached a specific strategic arms control agreement with the Soviet Union," he wrote. "Though never formally ratified, the agreement was adhered to by both parties and limited Soviet threats that our other conventional and nuclear weapons programs were designed to counter." The acting defense secretary, Patrick Shanahan, said in a statement Saturday that Brown's "steady leadership piloted our nation through a consequential segment of the Cold War. His focus on deterrence through a strong nuclear triad facilitated long-term peace and stability in the United States and Europe." Shanahan praised Brown for his "devoted leadership and lifetime of service." Brown was born in New York City on Sept. 19, 1927, attended public schools and went to Columbia University on an accelerated wartime schedule, receiving an undergraduate degree in physics in 1945 "when I was not quite 18," then going to graduate school at Columbia, receiving a doctorate in physics. In 1961, Defense Secretary Robert McNamara invited him to be director of defense research and engineering in the Kennedy administration. In 1965 he became secretary of the Air Force during the Johnson administration and, as he described it later, "served in that role through some of the most difficult and divisive parts of the Vietnam War." Carter nominated Brown to be defense secretary in 1977. He was quickly confirmed and served throughout Carter's term. During the 1980 campaign Brown actively defended the Carter administration's policies, speaking frequently on national issues in public. After leaving the Pentagon, he remained in Washington, joining the Johns Hopkins University School of Advanced International Studies as a visiting professor and later the university's Foreign Policy Institute as chairman. He remained active in matters of national security, including service on the Defense Policy Board, which meets quarterly to offer perspectives to the current secretary of defense. He served as a consultant to many corporations, often serving as a member of the board of directors. Carter awarded Brown the Presidential Medal of Freedom. President Bill Clinton gave him the Energy Department's Enrico Fermi Award for achievement in science and technology. At a farewell address from his job as defense secretary, Brown said: "Most satisfying of all is that for four years our nation remained at peace despite the world tensions and turmoil that constantly pose challenges to our interest and peace."